On June 20, the 2nd game of 77th Kisei-sen between Kisei Sato and Challenger Suzuki 8 dan was held in Aichi Prefecture, Japan. Sato won the game with 97 moves. The score after the game was 2-0 led by the title holder. Since Kisei-sen is 3 wins match, Sato needs one more win to defend the title. Suzuki has no more room to lose a game. 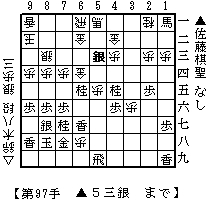 You can replay the the game from the start to the end here at Sankei Shogi Web. The diagram in the left is the resignation diagram at the 97 move of Sato's Silver drop on 5c. At the diagram, both Kings are not likely to be mated instantly. I think Suzuki thought the position was hopeless and that's why he resigned the game unless his King was threatened to be mated yet. I'm trying to guess what would be going on after the resignation diagram. In any case, transferring the promoted Bishop to the central square(5e) would be a vital move. The third game will be held on July 5.